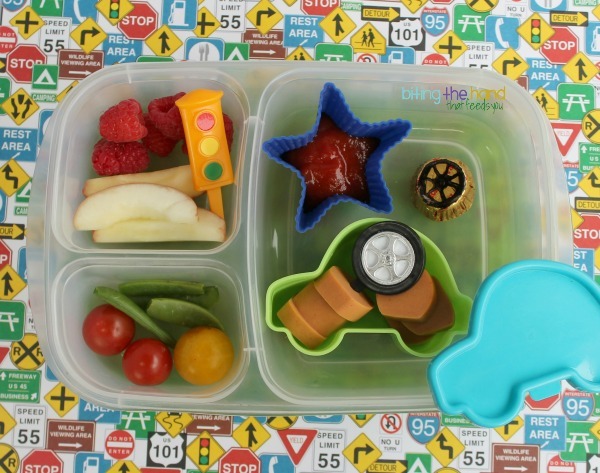 Biting The Hand That Feeds You: "On the Go" Car-Themed Lunches! 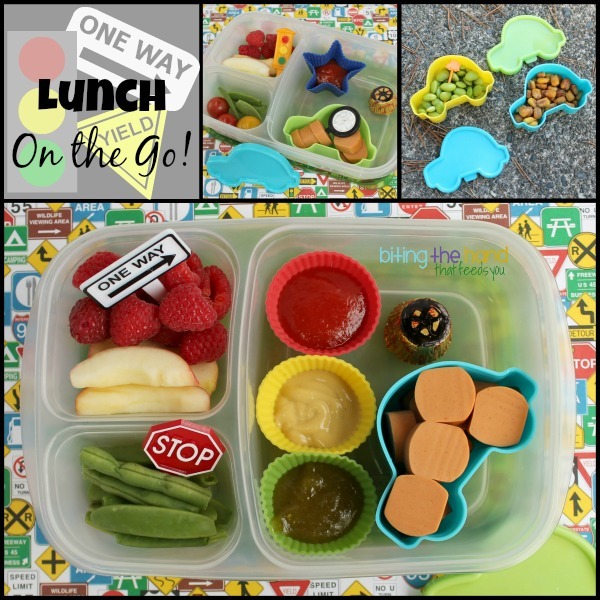 "On the Go" Car-Themed Lunches! Vroom vroom! I saved up colored heirloom tomatoes from our weekly farm share to make different colored ketchups... perfect for a stoplight lunch! 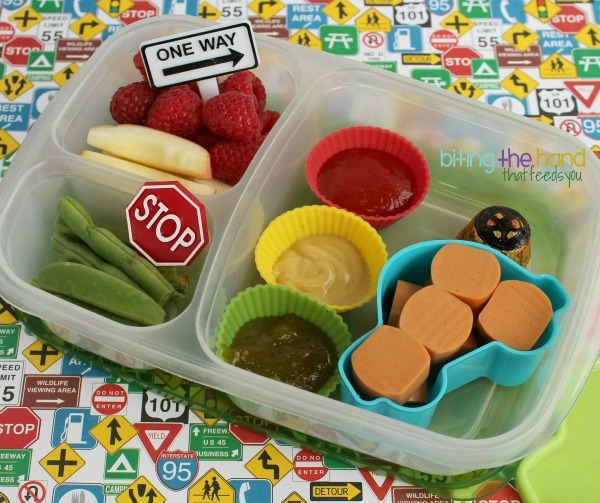 Friday, 9/27/13 - I used some mini red, yellow, and green muffin cups to hold the red and green homemade ketchups and some mustard, to make a traffic light. Stop! Go! 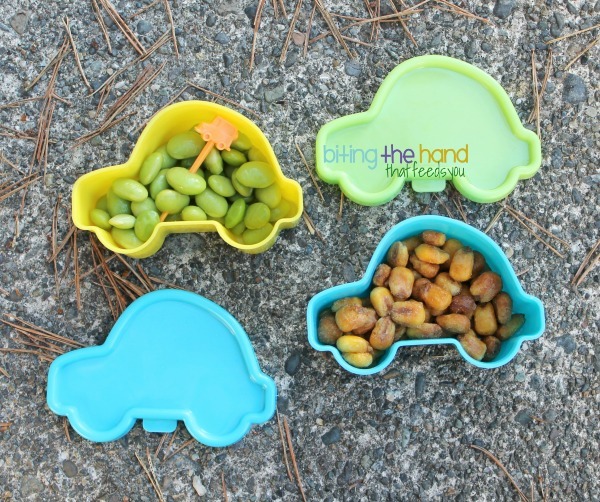 I boiled some gluten-free vegetarian hot dogs (SmartLife brand, or something like that) and cut them into "wheels" and put them in some car-shaped snack pots for both girls. The mini peanut butter cups are from Trader Joe's, and I used a sharpie in a meh attempt to draw a wheel or steering wheel or something on the wrappers. I made sure all the fruits and veggies went with the traffic light theme too. Fun stuff! The traffic signs and car wheel cupcake picks all came from a little bake supply shop, but there are similar themed traffic cupcake rings. Wednesday, 10/9/13 - I sent these for Z's Kindy snack one day. I stuck a toy car pick to help eat the edamame. Plus it's a cute little car! Squee! So cute! Love the ketchups! Love the cups of dipping sauces for the hot dogs (which, by the way, was the reason I absolutely HAD to click over from Instragram… couldn't figure out what in the world they were!!) What a great looking lunch!! Love all the fruits and veggies! STOP!! These are too cute!